There are many species here in Florida that are well into their breeding season. Around town, growing families of Ospreys, Owls, Cranes, Crows, Herons, as well as many others, can be seen perched in their nests or foraging about. Observing young birds interacting with their parents is a fascinating experience, from a safe distance of course, as well as observing the differences in independence among newly hatched species. While some chicks are hatched ready to leave the nest, others remain in the nest completely dependent on their parents for months. 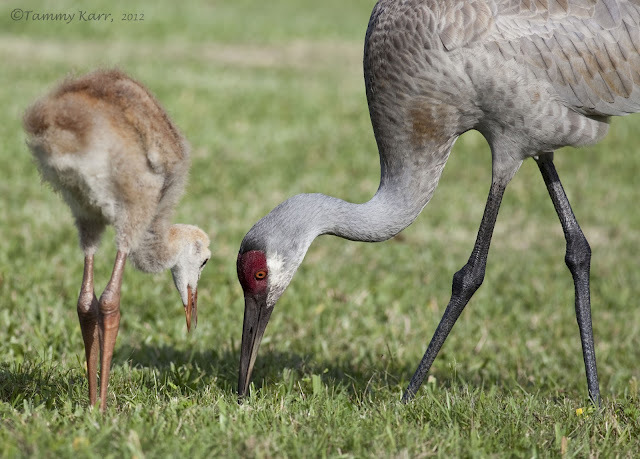 Sandhill Cranes breed here in Central Florida and over the past month I've seen several pairs with new additions. 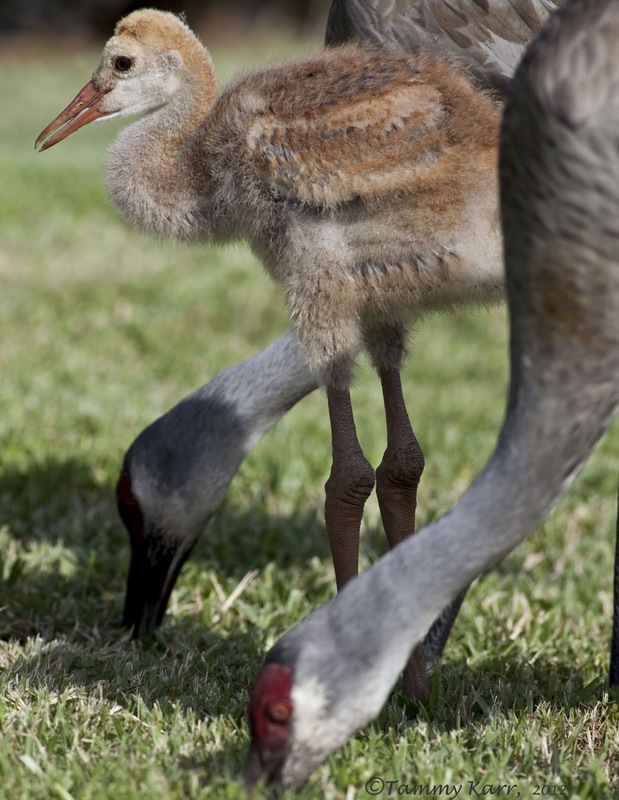 The Cranes can be seen toting their young, known as Colts, through parks, parking lots, busy roads, and residential areas. 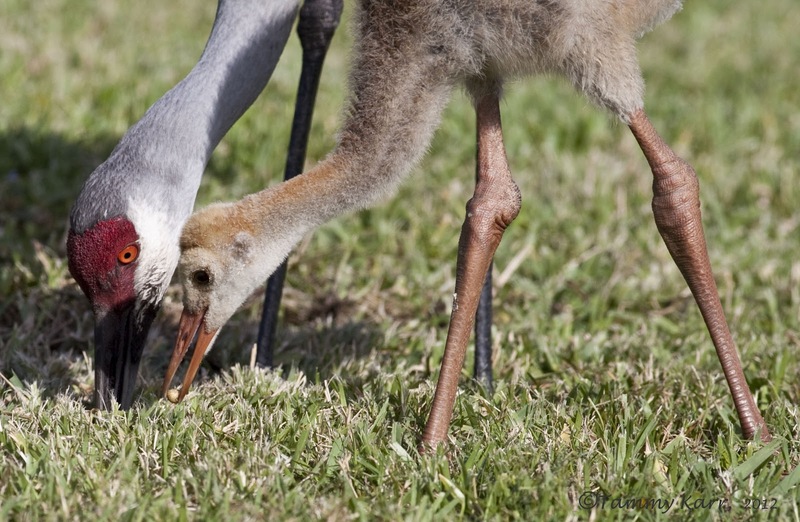 Sandhill Crane chicks typically leave the nest within a day of hatching. Both parents care for the chicks and assist in helping them forage. 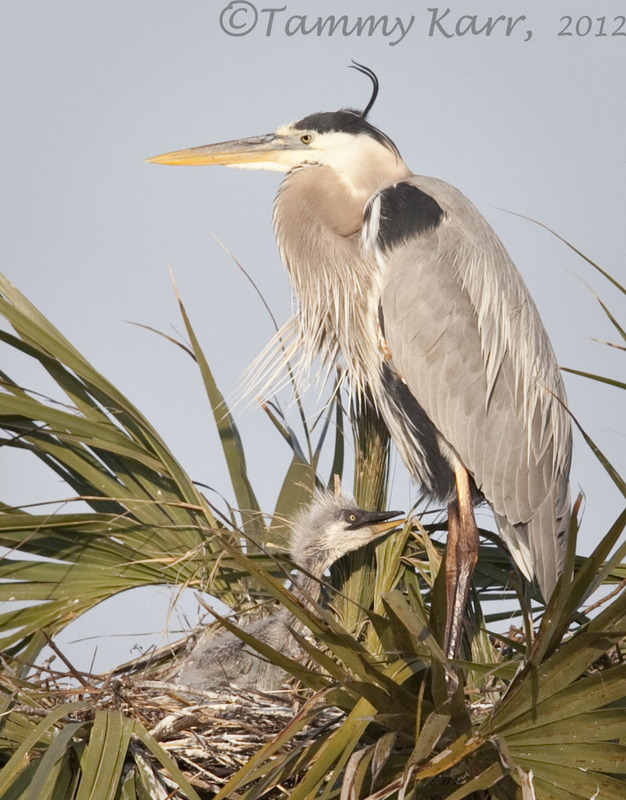 The Viera Wetlands is a popular breeding area for the Great Blue Herons, who typically nest on the tops the palm trees year after year. The first chicks of this year hatched about a month and a half ago. They grow quite rapidly as they reach nearly full grown in two months. 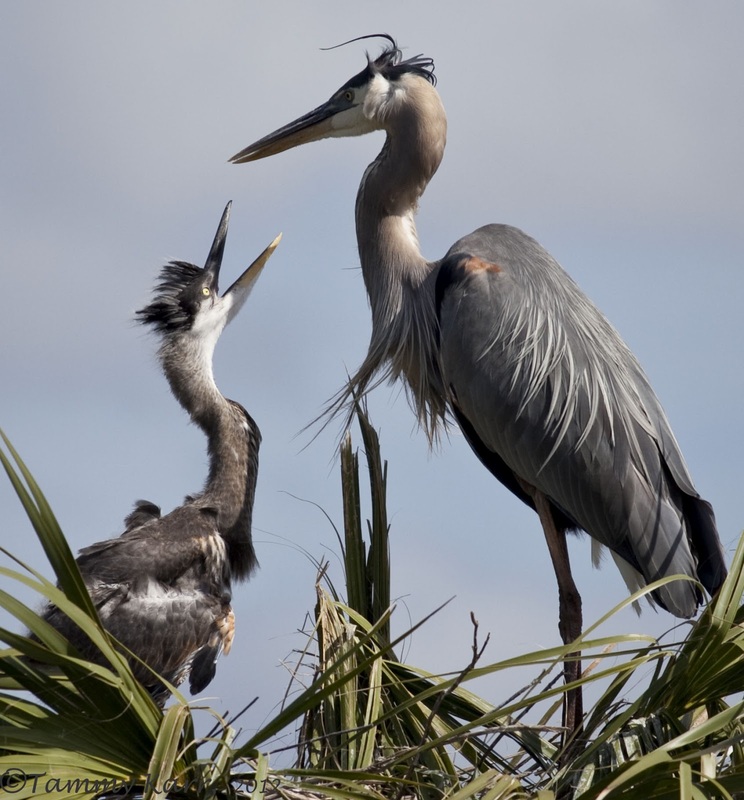 Being completely dependent on their parents for food until they fledge, the Great Blue Heron chicks at the wetlands can be heard expressing their desire for food. Their parents fed them by regurgitating food into the nest. As the chicks approach full grown, this task looks like a dangerous one! These chicks are getting close to fledging. 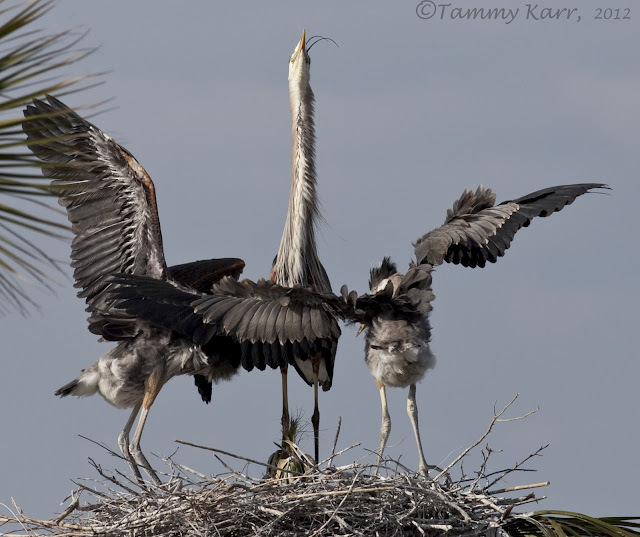 Much to the relief of their parents, they will be able to find some food on their own, however, they most likely will still come back to nest for some additional food. On some of those same palm trees at the wetlands are the nests of Anhingas, who are also breeding at this time. 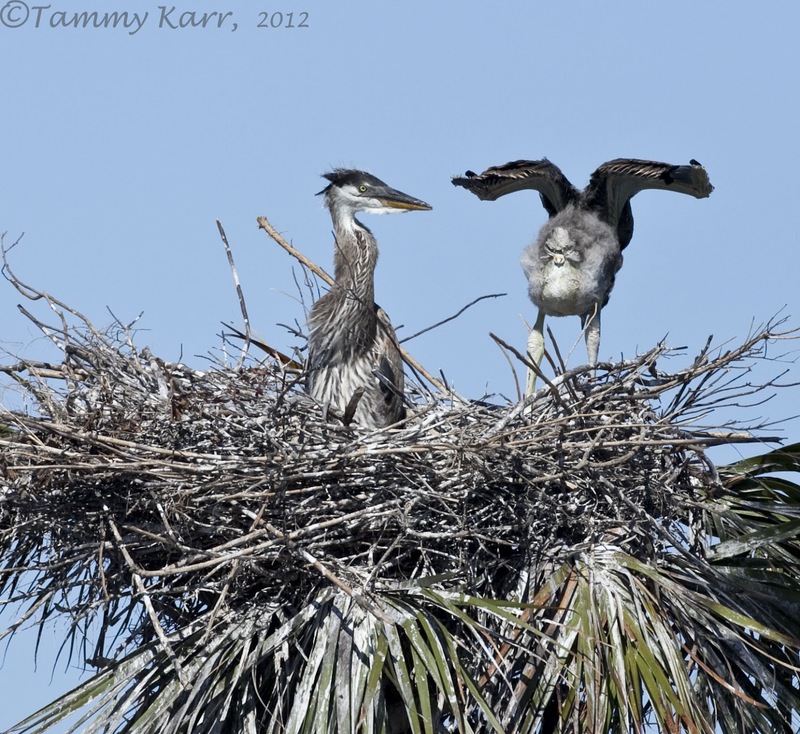 The Anhingas build their nests in the lower portions of the trees. The Anhingas are fed by their parents until they are able to fledge at approximately 6 weeks. 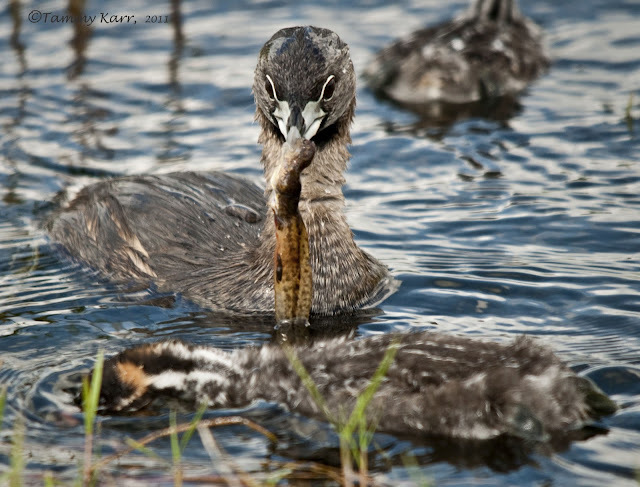 Pied-bill Grebes and Common Gallinules also breed at the Viera Wetlands. 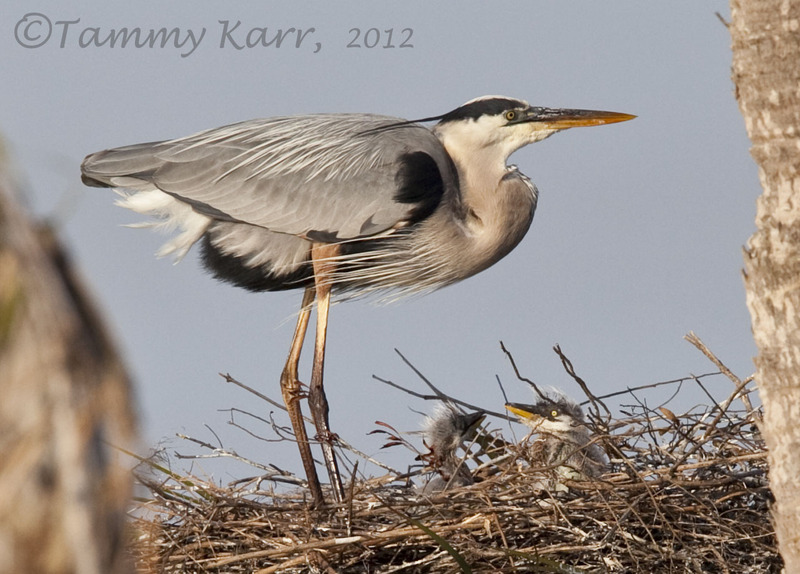 Both species of chicks leave the nest soon after hatching and accompany the parents while foraging. 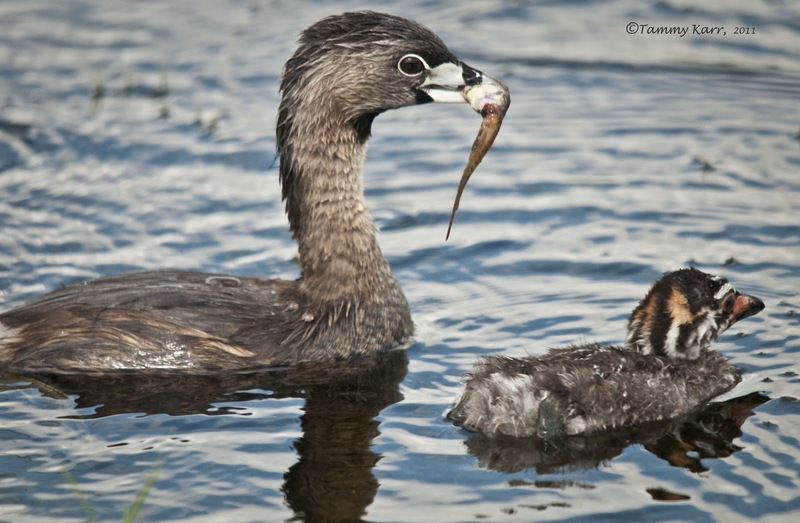 Very young Pied-billed Grebes canoften be seen hitching a ride on their parents' backs. They quickly attempt to forage independently, but receive plenty of help from mom and dad. Thanks for the great family portraits Tammy, they are wonderful! Tammy, you've outdone yourself this time! What an amazing post. Fantastic images Tammy a wonderful post.. It is difficult to comment on each one but they are all superb! The 3rd one before last is just extraordinary! Love the Sandhill Cranes too! Wow Tammy! This was great. 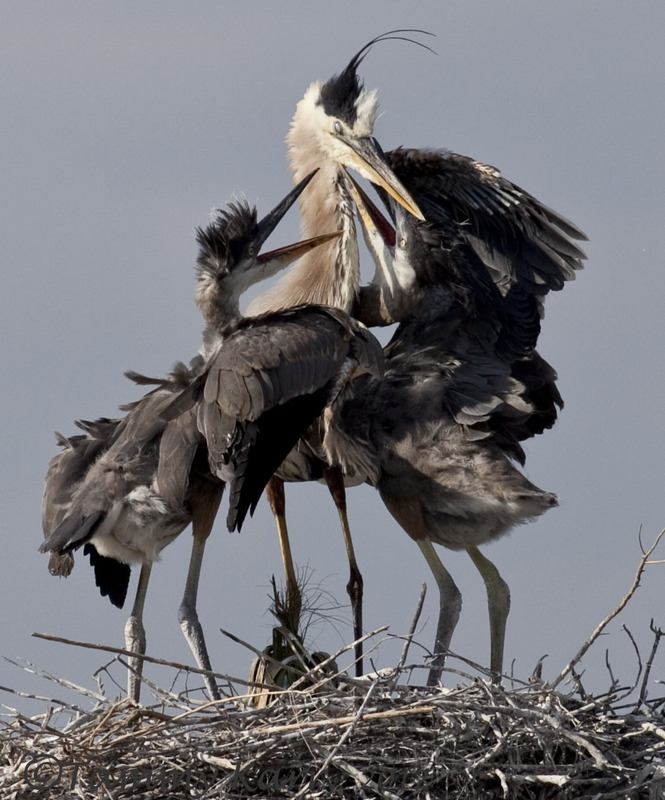 Incredible and intimate images of these nurturing birds. 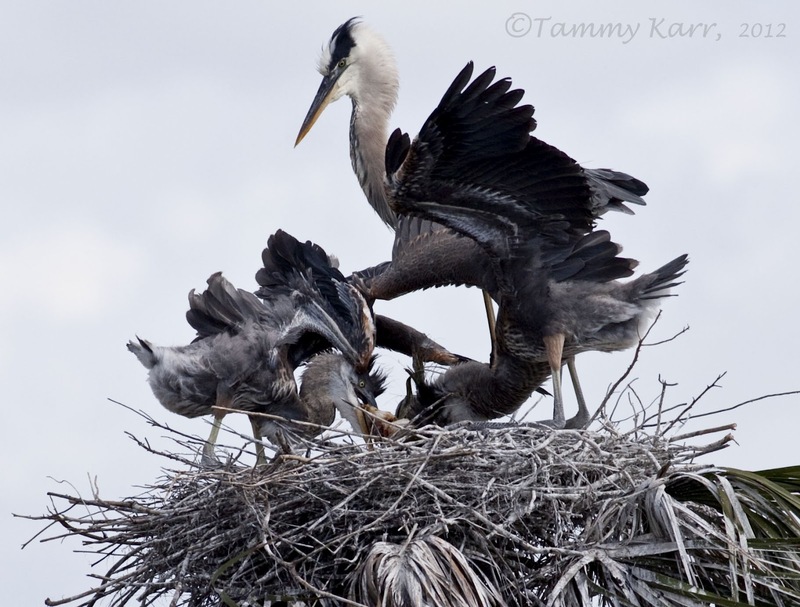 I've never seen Anhinga chicks before (kinda bizarre looking). Thanks for sharing your talent. great birds and amazing photos. The chicks are so cute! 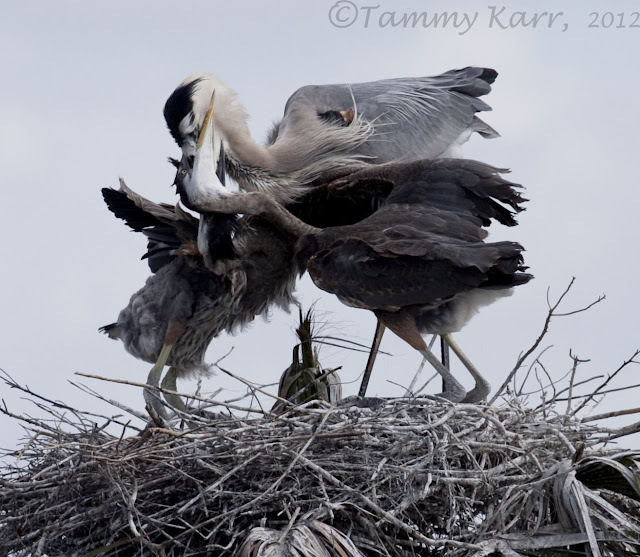 Oh Tammy, how fortunate you are to be able to watch the parent/chick interactions of all these beautiful birds! 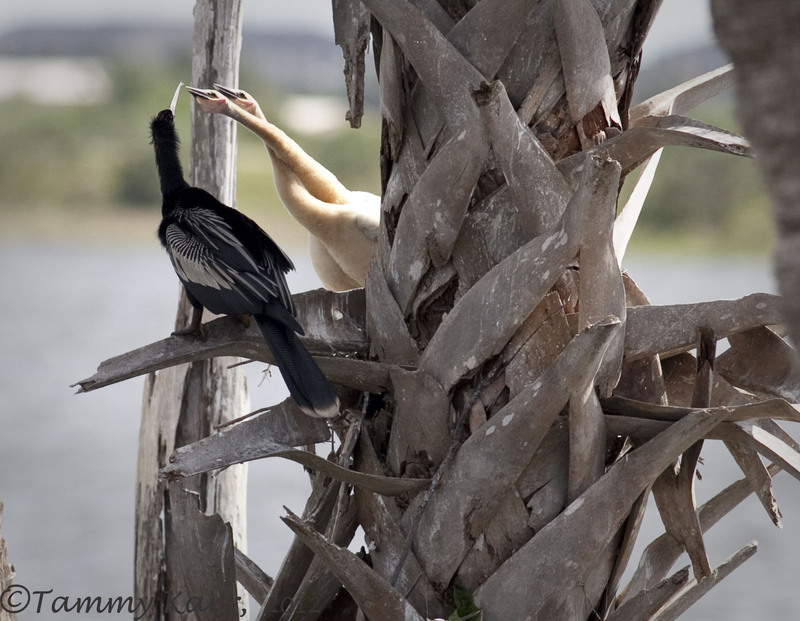 I really enjoyed seeing the little Anhingas, as I have never seen Anhinga chicks before, even in photographs. This is a fabulous post! Outstanding photographs! Extremely well done! Even looking at these pictures on my cellphone is a beautiful experience! Thanks so much. Thank you very much for all the kind comments!!! Beautiful images and a wonderful theme for the post! Love it! Great job Tammy.